Vessel is already out on Steam, so we didn’t want to bore you with a giant preview. 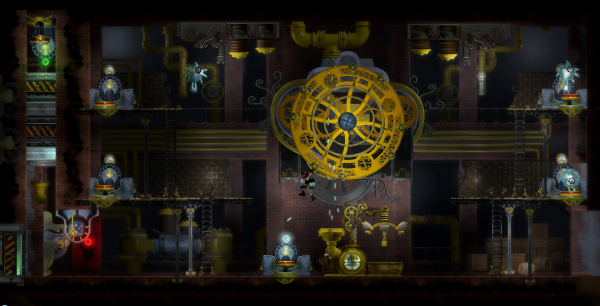 We did, however, stop by the booth at PAX East to chat with head John Krajewski, who confirmed that the physics-based puzzle platformer is still safely on its way to XBLA. As a quick recap for those of you who aren’t familiar with Vessel, you play the part of a genius scientist whose liquid-based automatons have gone a little mad, and it’s up to you to stop them. To help you on your way you’ll have to use the predictability of the automatons and a sweet liquid-sucking-and-blowing backpack to make your way through the world. John didn’t need to say much, he mostly stepped back and let the demo speak for itself. One area Vessel shines in is the difficulty department. The puzzles increased in difficulty over the course of the demo, and while some of them took a while to figure out, it wasn’t in a frustrating way — in fact, it left us with a sense of accomplishment that some games struggle to achieve. Almost overshadowing the puzzles are the amazingly beautiful backgrounds and sounds. While much of the demo took place in steampunk-y factories, there are also outdoor areas that looked just as good. If that wasn’t enough, Strange Loop tagged Jon Hopkins – former producer and contributor to Imogen Heap, Coldplay, and Brian Eno – to create the incredible soundtrack. So, will Vessel work on XBLA? The success of other puzzle platformers Braid and Limbo and the Steam release’s solid reception suggest that it should. Vessel delivers up solid puzzles without indulging in the hand-holding present in many of today’s games, then shores it up with a backbone of amazing art and a wonderful soundtrack. If you like the games mentioned above, this one should definitely be on your radar.